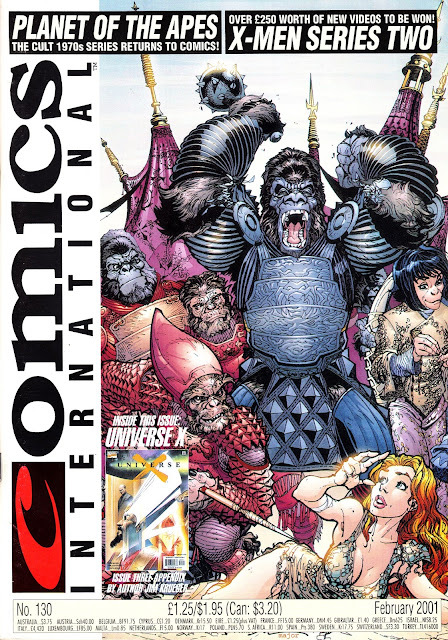 From February 2001: COMICS INTERNATIONAL issue 130 marks the return of PLANET OF THE APES, now based on the Tim Burton would-be movie franchise version, to comics. The four-colour reboot, published by Dark Horse in the States, soon ran out of steam when it became obvious that the 2001 movie hadn't inspired much long-term interest once the film left theatres. There was even a British edition - published by Titan - which recycled the US strips alongside some new feature-based material on the film. It didn't last long. not surprising since the movie was so uninspired. even the more recent reboot with andy serkis still wasn't a patch on the original movie series.